(CNS): National Baseball Hall of Fame sports star and author Cal Ripken, Jr. will be visiting Cayman this month as part of a tour to promote his latest instalment in a bestselling series for children about the sport. All-Stars: Wild Pitch is about Robbie Hammond, the Dulaney Orioles’ hardest-throwing pitcher and coach’s son who can’t find the strike zone. His team is on a losing streak and has been nicknamed the Snore-ioles. Ripken, who was a shortstop and third baseman for the Baltimore Orioles for his entire career, nicknamed "The Iron Man" for his relentless work ethic, is most remembered for playing a record 2,632 straight games over 17 seasons, shattering the record previously held by Lou Gehrig at 2,131. He was a 19-time All-Star and is considered to be one of the best shortstops professional baseball has ever seen. Ripken is CEO of Ripken Baseball, Inc, a company dedicated to growing the game of baseball at the grassroots level, and an author of kids’ books about the sport. He will visit Books and Books at Camana Bay Monday, 11 March at 7pm and appear at the Hollywood movie theatre to talk about his career as a player as well as his series of books. The event is free and part of the Books & Books International Visiting Author Series. I'll take a sport that requires a fine tuned athletic physique over those any day, e.g; Athletics, Basketball, Speed skating, Football, Boxing (oh yeah! ), etc. Let me think, oh yes, cricket demands patience, skill and intelligence, attributes that you can never be guilty of. I suspect most will be far more interested in his career as a Pro Athlete over his book(s). I for one will be going through my old baseball card collection to find any of his cards to get signed. He is a famous rounders player apparently. I prefer cricket myself. Cal Ripken is baseball’s all-time Iron Man. 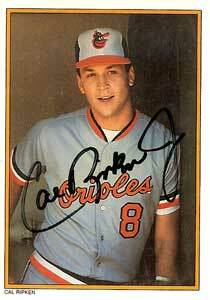 He retired from baseball in October, 2001 after 21 seasons with the Baltimore Orioles. His name appears in the record books repeatedly, most notably as one of only eight players in history to achieve 400 home runs and 3,000 hits. On July 29, 2007 he was inducted into the National Baseball Hall of Fame. One of the greatest sonny. And a great guy. Oh yea grandad, he belongs to a sport that no one outside of the American sub continent really gives a s### about. Like American 'football', they think that by calling it a world series that it makes it so. Well news flash, it doesn't, its just an excuse for over weight arm chair sports men to imagine what could have been if they hadn't eaten their way through most of the worlds cattle supply. Try following a real sport that doesn't rely on repetitive stops and a constant flow of mind numbing statistics in an attempt to make it look interesting and worthwhile. Hardly an athlete though when all he has to do is hit a ball and run around a square marked with rest stops. So he has good hand/eye coordination, big deal, so do old ladies that knit. I suspect no one outside of the USA really cares. Going on the responses so far, I believe that is a correct assessment. Why don't we concentrate on the great West Indian cricket players instead of a sport from another country and heritage.